Gold Cup Day at the final day of this year’s Cheltenham Festival was a wet one today but rain (and a LOT of mud) did not seem to dampen racegoer’s spirits. The final day of the races this year saw four royal hats, all worn by members of the Phillips Family. Princess Anne repeated her turquoise felt fedora with two-toned, layered silk hatbands and side spray of feathers. It’s one of my favourite hats in her wardrobe and was a chic choice for the races, standing out against grey skies. I adore the mix of hat and coat with the grey printed scarf. Autumn Phillips wore a new hat, described by the milliner as “A rich Burgundy fur felt fedora, trimmed with two rows of navy braid. The fedora has a wide brim which gently slopes down flattering the face.” I love a good fedora and this one is GREAT on Autumn. Peter repeated his well-worn brown fedora. Designer: Camilla Rose Millinery. It is the Dusk Fedora from AW 2018. Guinea London velvet coat. Zara Tindall has had stellar looks all week but, I think, saved the sharpest for last. Topping her marvellous black and white checked coat was a black felt saucer hat trimmed with a single white quill and a folded red leather bow. The hat is a style and scale we’ve seen many times on Zara but the overall look is so beautifully styled, it looks fresh and fabulous. Designer: Bespoke Sally Ann Provan. Coat by Claire Mischevani. That wraps up this year’s Cheltenham Festival. We’ve seen 12 royal hats at the races this year- which ones have been your most favourite? Princess Anne took in the second day of racing at Ascot today, joined by her son and daughter-in-law. She repeated her cream straw teardrop percher hat with upturn on the rounded back of the design. Lavishly trimmed with looped straw bows, silk flowers and large bows in white net, the light hat is well suited to a day at the races. I’m not a great fan of its pairing today with Anne’s brown silk dress and beaded ivory jacket (its “a whole lot of biscuit” to quote a favourite comment here) and would have preferred the piece paired with something more colourful. This is one of the more modern millinery pieces in Anne’s wardrobe and I’m afraid this outfit brings it down. While I was a bit disappointed in Anne’s chocolate biscuit look, Autumn Philips did not disappoint, topping her blue and white printed dress with a matching sidesweeping percher saucer hat embellished with a mass of trimmed white feathers curving out from beneath the hat’s raised brim. The colour is so lovely on Autumn, as is the scale, and the upward soaring hat works so beautifully with this dress. If one must wear a high ruffled neck, this is the kind of hat to pair with it! Designer: Philip Treacy. Beulah London dress. Peter looked dapper in his repeated black silk top hat. What do you think of this family’s trio of hats? 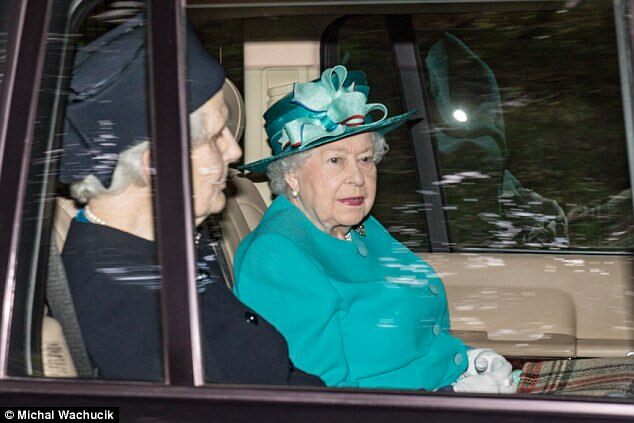 Queen Elizabeth wore a new teal blue hat to church last Sunday. Frustratingly, there are no pictures I can share but you can see it here. Today, she made a surprise appearance at the Aboyne Highland Games in her lilac straw hat with flowers by Rachel Trevor Morgan. I’m also curious- the shine on these photos makes me wonder if Mike Tindall has purchased an antique silk hat? I’ll trust those of you who are experts on such things make a determination on this! to this day, thirty years ago, when Princess Anne was accompanied by young, hatted Peter and Zara Phillips to the Windsor Horse Trials.